On December 23rd, 2018, a large meteor exploded in the atmosphere over the Barents Sea not far from Russia’s, Kamchatka Peninsula. It exploded in such a remote region that it went almost unnoticed for several months. It is estimated that the meteor exploded with a force of 173 kilotons of TNT–ten times the force of the nuclear bomb which hit Hiroshima, Japan at the end of World War II. I marvel that this kind of power can be generated from a meteor that was estimated to be only 10 meters (30 feet) in diameter (first link). A faint image of the distant blast was captured on a Japanese weather satellite (first link). The second link adds that the meteor exploded an estimated 25.6 km above the earth’s surface, and it includes a global map of meteor explosions and their respective intensities over a two-decade period. The second link also notes that meteor blasts of this intensity are normally expected only 2-3 times per century. Since we have had two such major meteor blasts in our atmosphere in just the last 5 years (the other one was over Chelyabinsk, Russia in 2013), it would seem we may be entering a period where meteor strikes into our atmosphere may be on an uptick. The third link and fourth link are added for additional perspectives. The Chelyabinsk meteor explosion was a larger explosion than the recent one off the Russian coast, and it was caught on many cameras due to it happening over a city. I’m sure many readers recall the images of the Chelyabinsk explosion in media sources at the time, but I have included the fifth link which has an impressive montage of many video recordings of that 2013 explosion. Not all the images have audio content, but a few have very impressive audio recordings of the event. There is a particularly impressive audio recording of the explosion just after the 3-minute mark of the fifth link’s video. It records what sounds like a very large sonic boom followed by a series of reverberations after the main explosion. The intensity of the actual sound of the explosion in the fifth link makes me think that some of the video camera images of the explosion were captured from further away than one might have assumed to be the case. I urge all readers to listen to the intensity of the explosion mentioned in the fifth link. If you have a sub-woofer as part of your computer’s speaker system, you are in for an impressive auditory experience! So far, mankind has been fortunate that a large meteor impact has not hit the earth’s surface in a populated area. The meteor that struck Siberia in the Tunguska region in 1906 was in an area so unpopulated and remote it was largely unknown to the world for some time. If it had hit in some populated regions of the earth, it could have essentially wiped out small nations. 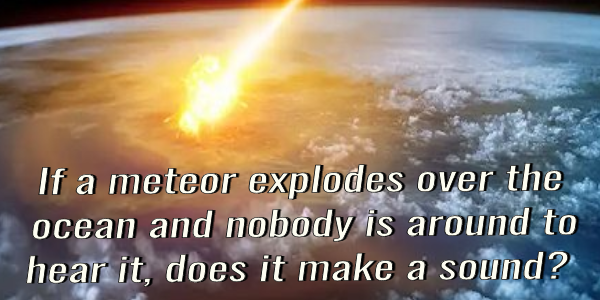 There have been several Hollywood movies about meteors so huge that they would annihilate life on earth. Two that come to mind are Deep Impact and Armageddon. In Hollywood movies, mankind always figures out a way to save itself from cosmic destruction. In the future, we may not be so fortunate. For solid evidence that we are, indeed, living in the biblical time called the “latter days” when the above prophecies will come to pass, please read my article, Are We Living in the Biblical Latter Days?